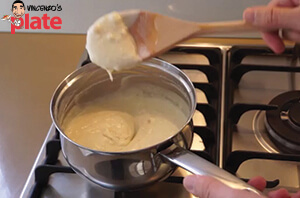 Bechamel Sauce is a white creamy sauce that can be used for a variety pasta or meat dishes and is very simple to make. 1. Turn the stove on to a medium-low heat. 2. Add the butter to your pot and place it on the stove. 3. Wait until the butter melts. You can help it by moving it around with a wooden spoon. 4. Place the strained flour into the pot and quickly mix it into the butter, still using the wooden spoon. 5. Keep mixing until you can no longer see the white flour. 6. Break down any of the larger pieces of the mixture and continue to mix. 7. Pour half of the milk slowly over your mixture while still on the stove and start to mix it through. 8. Add the remaining milk, nutmeg and table salt. 9. Continue to mix the sauce until it becomes creamy and there are very few or no lumps. You can use this sauce in many of my recipes, including Graziella’s Zucchini Crepes, my vegetable lasagne or my Crepe Cannelloni with Ricotta & Spinach!